A California-based start-up called Willow Garage is hoping to accelerate the adoption of robots into human society by lending eleven robots to different research institutions across the world. To kick off the new program, Willow Garage held a "graduation ceremony" earlier this week at the company's Menlo Park, California headquarters. 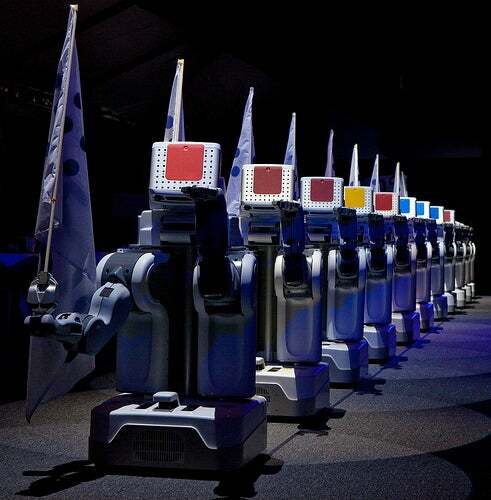 During the event, eleven of Willow Garage's PR2 (Personal Robot 2) units paraded before an audience showing off their capabilities including a coordinated flag waving dance to Mr. Roboto by Styx. The PR2 robot includes a mobile base, 2 arms for manipulation, sensors and 16 CPU cores. The machines use Willow Garage's ROS software platform, a free open-source robotic operating system. Collectively worth well over $4 million, the PR2's will each spend two years at their respective institutions where researchers will see how robots can aid people in daily life. German manufacturer Bosch, a PR2 recipient, wants to outfit the PR2 with a virtual skin that will allow the robot to feel its physical environment. Georgia Tech will study how the PR2 can assist senior citizens in the home with a variety of tasks including mundane functions like opening drawers, turning on lamps and operating light switches. The University of Tokyo will be working on how to get robots to clean up human spaces, and work co-operatively with other robots. And the University of California, Berkley will see if they can teach (instead of program) a robot to perform factory manufacturing and assembly tasks. Stanford University's Adam Leeper and Morgan Quigley pose with PR2. Six of the eleven institutions selected by Willow Garage are in the United States including Georgia Tech, Massachusetts Institute of Technology, Stanford University, University of California Berkley, University of Pennsylvania and the University of Southern California.